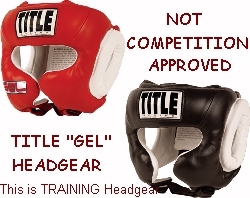 Headgear that are sold with the word "Training" in there title are not legal "Competition" headgear for IKF Amateur Kickboxing. (Just like they are not allowed in USA Amateur Boxing) The issue with "TRAINING" Headgears is that they usually have the large ear padding or the jaw bars. When you look at the LEGAL Competition Headgear you will notice there is no Jaw Bar and the Ears are far less padded. To Accommodate Small Through XL Sizes.